The Standard Horizon PF-P3100 is a semi-automatic paper folder that offers quick set-up of six preset standard folds and four common paper sizes. The variable speed motor can be adjusted from quiet mode (low speed), medium mode and high speed mode all with a touch of a button. The quiet mode is a top level sound deadening design that ensures a quiet operation which does not disturb the office environment, and is suitable to fold thinner sheets of paper. In this silent mode, the sound pressure is reduced up to 40% compared to other models in this range. 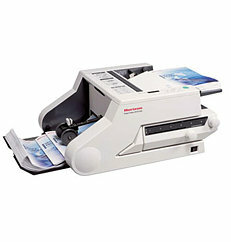 The high speed mode is the maximum folding speed and can fold up to 240 sheets of paper in a minute with a single fold. The high speed mode is most suitable to fold thicker sheets of paper. The standard mode has a unique drive control system that is used for quieter operation at a higher production speed, folding up to 140 sheets of paper in a minute with a single fold. The PF-P3100 also features a power saving mode for environmental friendly operation and the ability to hold as many has 300 sheets of paper in the tray at once for feeding. After the sheets are folded they are neatly stacked on the delivery conveyor for easy and neat removal. The PF-P3100 has a wide variety of folding patterns, and push button controls, LED indicator lamps, and a simple fold plate adjustment controls which all the operator to quickly and accurately dial in the desired fold. With this paper folder, you can easily change the feed roller and separator pad and tool-less removal of the buckle plate and the fold rollers makes jam remove or cleaning a simple task. The Standard Horizon PF-P3100 desktop folder offers quick set-up, easy operation and enhanced productivity which makes this machine ideal for church, schools, small in-plant, print shops and reproduction centers, or companies folding booklets, brochures, envelopes, and more! If you have any questions or are interested in purchasing the Standard Horizon PF-P3100 Paper Folder, visit us at SpiralBinding.com. We have great pricing on a full line of Paper Folders. Call us at 1-800-631-3572 for more information.